Frank Morales. Photo courtesy of UNC Asheville. 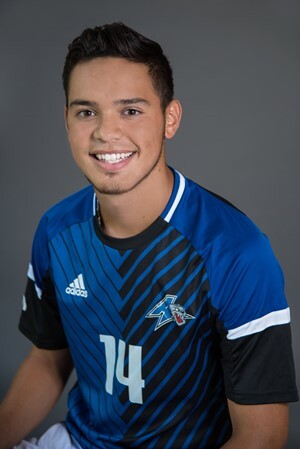 Driving an hour daily for practice and games, keeping up with school and wisely managing time: a UNC Asheville soccer athlete shares a glimpse of his long athletic and academic journey. Frank Morales, a freshman chemistry student, exemplifies the hope and dedication many college athletes maintain in order to achieve their goals and aspirations. “I was about three years old when I started playing soccer and continually played for three years for a small team at my hometown Windsor, Colorado,” the 19-year-old said. At age 11, Morales started competitively playing soccer for an academy in the state capital of Denver. As an academy soccer player for the Colorado Rapids, Morales was not able to play for his high school soccer team. There was a rule that academy players were not allowed to play for the high school team due to the level of competence. Morales’s parents and brother loved and supported him in his soccer pursuits, driving him daily to practices and games in Denver. His mother would pack sandwiches to eat and Morales would have to do his homework in the car during the hour long trips. In Denver, Morales would compete in soccer tournaments where college teams and coaches would come to observe the players and their performances. Morales came to visit UNCA and fell in love with the campus and its surrounding city. He visited other college campuses but none interested him. Growing up, he played several positions on the soccer field, but he currently plays center-mid. Morales said he has soccer practice and works out daily for about three hours. He practices with the team for an hour to an hour and half, and then practices extra time or goes to the gym. Religious Christian beliefs and family have had great significance in Morales’s life. These important values have helped him maintain education and soccer inspirations. “I think of how my God and my family have supported me to achieve my dreams and that motivates me and keeps me going,” Morales said. During soccer games, he wraps tape around his wrist and writes, “con la fuerza de Dios y mi familia”. This Spanish phrase means “with the force of God and my family” in English.